So you’ve been searching for the perfect night vision device. There’s only one problem. You go online and after a brief search for the best night vision goggles, you realize that there are way too many options to decide. For this reason, we spent the last 12 months testing out various NVD’s to narrow it down to the best on the market. In this ATN PVS7-3 Night Vision Goggles review, we are going to share with you how this device made our list. The ATN PVS7-3 night vision goggles (Click here to check the price on Amazon) are lightweight, have great resolution, are extremely sensitive in lower light condition, and incredibly easy and comfortable to wear. Something that was impressive about the ATN PVS7-3 that we noticed is that when properly adjusted, they were so comfortable that we never experienced any eye fatigue. On the day we tested this unit it was an extremely cloudy night with a full moon, and the result was an unbelievably clear picture. We took these on a local trail that goes through the woods and even without using the built-in IR illuminator and could see individual leaves on a heavily wooded country lane approximately 50 yards away, with even a slight misting of rain. 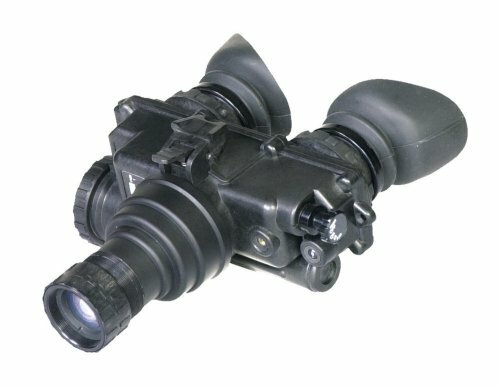 The ATN PVS7-3 night vision goggles are a generation 3 night vision device. This means overall the image appears crisp, clear, bright and sharp with a very minor amount of noise on dark cloudy nights. There was definitely a huge difference between this model and the generation 1 night vision devices we tested. One thing that is worth noting on the PVS7-3 is that it has 40-degree field of view, after a few minutes you do get used to the “tunnel vision”. In addition, the optics are good and show no real distortion. The 40-degree field of view feels like “tunnel vision” but after awhile you get used to it. Built-in infra-red illuminator works like a flashlight for close viewing to 50 yds. Approx. 6 1/2 x 3 x 6″ and 24 ozs. Q: Do these auto adjust to light? A: It would be recommended to keep this out of direct artificial light. Too much exposure will damage the lenses. A: Yes. These are meant to be handheld. We have to admit testing the ATN PVS7-3 night vision goggles was a blast. There is a lot to like about this night vision device, but we were just astounded by how clear of a picture we were able to see. Even without the IR Illuminators active, it was fairly easy to see even in darker conditions. 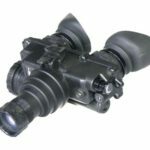 If you found this ATN PVS7-3 night vision goggles review helpful, please take a moment to share this post on social media.